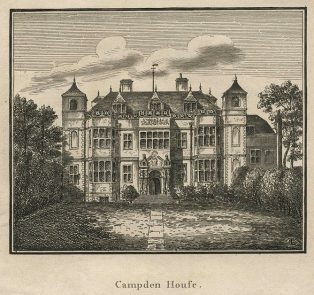 Sir Baptist Hicks bought the Manor of Campden from Anthony Smyth in the first decade of the seventeenth century, although Smyth died before the sale was completed. A number of lawsuits ensued between various parties, concerning who owned what and who owed what to whom. Regardless of these not-so-petty squabbles, the hugely wealthy Sir Baptist went ahead and started to build a large country mansion and formal gardens. There is very little positive evidence about the building of the house, when it was completed and what it looked like inside and out. Given his other commitments in London and land holdings elsewhere, it seems unlikely that Hicks and his family spent much time in Campden. Nevertheless the house and gardens must have been grand enough to satisfy the aspirations of Hicks and his wife Elizabeth, without appearing to exceed his social status. 1612 is generally given as the year the house was built – a busy year for Hicks, who was, apparently at the same time, also building Campden House in Kensington and Hicks Hall for the Middlesex magistrates. There is a great deal more information about the Kensington house, which survived until the mid-19th century, so we can speculate that the style of Campden House in Campden might have been similar, apart from the fact that the Kensington house was built in brick whereas the Campden house was, of course, built in the local Cotswold stone. 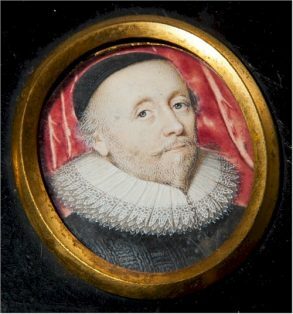 Sir Baptist Hicks died in 1629 and bequeathed Campden House, Campden and all its contents to his elder daughter Juliana, who had married Lord Edward Noel in 1605. Campden supported the Royalist cause but being so close to the crossing of two important routes – one used by Parliamentarians and the other by Royalists – things were rarely quiet. In January 1645 Colonel Henry Bard and his 300 troops occupied Campden. Bard reported to Prince Rupert that he had arrived at ‘Cambden House, with my forces’ and they were ‘taking great pains, with spades, mattocks, and shovels’ to fortify the house. But in May that year, the garrison was withdrawn and marched westwards to Evesham where they joined the King’s army on its way towards Worcester. Before leaving, the house, built less than 40 years before, was set on fire and burned to the ground apparently on the orders of Prince Rupert. The stone from the ruined house probably found its way into other buildings and houses around Campden. It is not known to what extent the house was furnished at the time of the fire, or whether any furniture or fittings were saved. At some point the stables were converted into living accommodation (now called The Court House) and traditionally Juliana, Viscountess Campden, lived there (hence ‘Lady Juliana’s Gateway’). 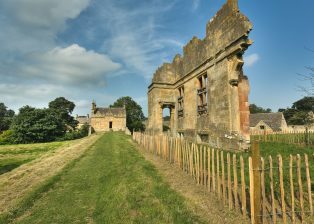 The Banqueting Houses were also converted for estate servants and we know that William Harrison, Lady Juliana’s steward, lived in one of them at the time of his disappearance (see page on The Campden Wonder). The main residence of the Noels, however, was at Exton in Rutland. We are grateful to The Landmark Trust for their permission to visit the site of the house and gardens.